Good news for smart phone users–the Alameda County Library is now mobile! Take your library wherever you go. Use the mobile app to search library catalog and place holds, manage your library account, locate libraries and hours, find out library events, ask questions, access library blogs, Facebook and Twitter pages. The Alameda County Library’s mobile app is compatible with most major smart phones, including iPhone, Android, Blackberry, and Windows Mobile. 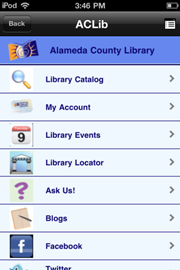 Just search “Alameda County Library” in the Apple App Store, Android Market or Blackberry App World and download it for free. You may also go to http://acl.boopsie.com via your mobile devices’ Internet browser. So check it out on your mobile device today! Be Creative @ Your Library! Summer Reading Game is about to start! Now I love to read , but sometimes you want someone else to do the work, especially if the book is supposed to be ‘good for you’. May I suggest have the author read to you? Here is Neil Gaiman reading his Newbery Medal winning book, The Graveyard Book. Want something more dramatic? Why not listen to some dramatic readings from Good Masters! Sweet Ladies!, The 2008 Newbery winner. And there is always the old fashioned way, why not watch a movie? Here is the movie trailer from one of my favorite Newbery books, Mrs. Frisby and the Rats of NIMH. Wait… You want to know more about the book before you see a movie? Head on over to the Children’s blog for a review. An economic forum The Silicon Valley Economy: 2009 and Beyond – Challenges and Opportunities took place on October 24, 2008 at the Fremont Main Library in partnership with the Fremont Chamber of Commerce and the Alameda County Library Foundation. Addressing a variety of issues relevant to today’s economy and other timely topics renowned keynote speaker Dr. Russell Hancock, President and CEO of Joint Venture: Silicon Valley Network shared insights and information that will impact your outlook for the economy in 2009. Joint Venture: Silicon Valley Network is a group of visionary leaders from business, labor, government, the universities, and the non-profit sector who build creative solutions to solve problems in their community, and to work as teams on current initiatives. Our panel moderator was Jim Cunneen from California Strategies, LLC. Jim served as a California State Assemblyman from 1994-2000 creating a distinguished record on high technology and quality of life issues. He also served as an executive for two highly respected Fortune 500 Companies in Silicon Valley and was President and CEO of the San Jose Silicon Valley Chamber of Commerce. This economic forum consisted of a panel of speakers who are leaders from industry and the business community. Drawing from a wealth of experience the panel shared insights and perspectives about today’s compelling business issues and the shifting economy in the context of our local community. Challenges and concerns specific to the industrial and manufacturing sectors, small business, and real estate, with a perspective on local issues, which will impact the future development of California and the Silicon Valley as a community.